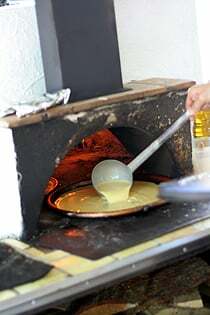 A few days later, while standing on the square in Vence, waiting while a young man poured chickpea batter onto a very hot oiled griddle, a timid young American woman asked him for a crêpe. He explained, in fractured English, that he only made socca, and she started to walk away. 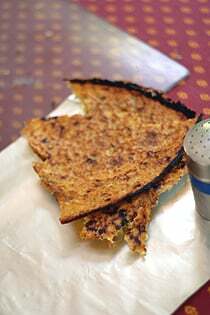 Because I hate to see anyone miss out one something so delicious, I brashly stepped in, telling her the chickpea griddled-cakes were a specialty of the region and that she really should try one, but she wasn’t convinced and left empty handed. Me? I was waiting for my second. 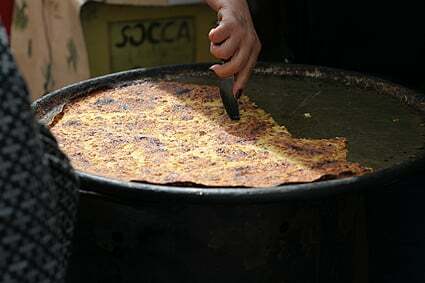 Socca is a specialty of the region and you’re not likely to find them being made anywhere else. And it’s not something one makes at home: to be authentic, socca should be baked over a fire. (Here’s a socca recipe, in case you’re determined to try one at home.) The best are baked on a searing-hot griddle, and even though I’ve been on the Côte d’Azur less than a week, I think I’ve tried so many that I can crown myself an expert. And I’ve got the gut to prove it. Believe me, there’s nothing that will make one feel more tubby than to spend a day on a beach surrounded by French people in those micro swimsuits. Rosa Jackson, who’s been leading culinary tours of Nice for years, and lives in the old part of the city herself, asked me where I wanted to go when we met. Not hesitating for a moment, I said “For socca“, so we breezed past some great food shops, where she pointed out some of the local specialties, until we arrived at Chez Pipo (13, rue Bavastro, Tél: 04 93 55 88 82). There’s a lovely little market in Vence with local farmers selling their fruits and vegetables. But the big draw is the socca-maker. (He told me he’s just there on Fridays and Sundays.) 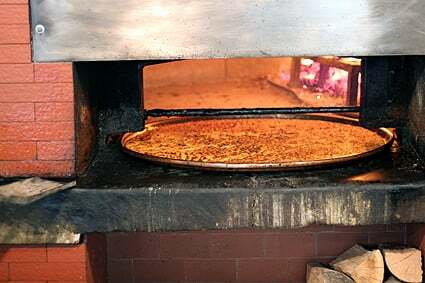 Each socca feeds two, and you have to wait for him to make them, which he does two at a time, to order, in his small, but effective, wood-fired oven. Super-crisp and sprinkled with salt and pepper, after I did my rounds of the market, I found myself back at his stand, ordering my second. Then I found myself back there today…so in case you were in the area, and saw some guy hovering impatiently by the oven, that was me. In the midst of the daily Cours Saleya market, in Vieux Nice, stands an overly made-up woman, serving socca from a larger, fire-breathing drum. 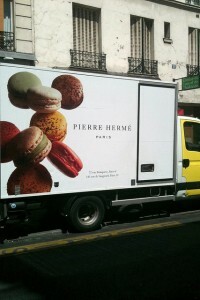 Thérésa will scrape off shards and bring them to your table, along with plastic cups of well-chilled rosé from the Var. And I can’t imagine a better way to spend ones first morning in Nice, which is where I spent mine. The socca is actually baked just a few blocks away and rushed to her stand via bicycle. Be sure to arrive early, as she runs out around 1pm and when she’s done, that’s it for the day. Très provençal. Later in the week, eager for more, I arrived at 1:02 and had just missed her last batch. I love socca and appreciate the posts and the pictures. Gregoire in Berkeley had a socca place in the epicurious garden next to Chez Panisse and it closed….and there alas went my socca source. Silly American girl. I’m drooling and seriously considering trying this with a cast iron frying pan over the fire place. Maybe. This sounds a lot like “Cecina” which is a specialty in Lucca, Italy. I just discovered it myself for the first time earlier this month at Pizzeria da Felice, and reportedly they make the best pizza (and cecina) in Lucca. I feel like I can smell them through my laptop screen. Do you think these are easily replicable at home? Carolyn: I love Lucca! It’s a great city. Didn’t try any cecina there, but had a lot of other delicious things. Mary: Genoa is great, too. The food shops along the oceanfront are incredible. Be sure to eat lots of pesto! C(h)ristine: Like many food, socca doesn’t particularly travel well (as an idea…) so you may need to join Carol in coming to Nice and trying it for yourself. I now have a desire no, need to visit Nice, it was never really high on my list, it’s moved way, way up now, maybe even for next year’s trip. 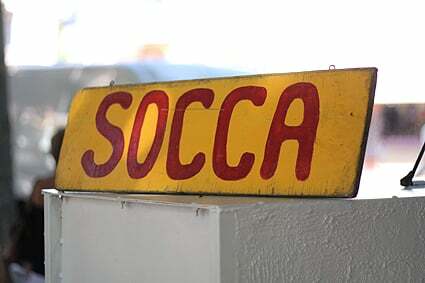 Had never heard of socca but now you’ve got me wondering whether I can build a little brick oven in my backyard the kind I would see out in farms of my country when I was a small girl. I’ll have the fire department number in hand just in case. Why the pairing with rosé? Curious as to what it brings out in taste. 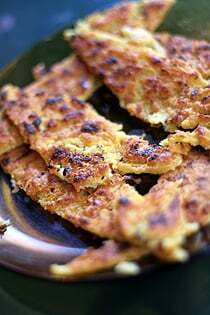 I’ve made socca with this socca recipe and I think it’s quite fantastic. The recipe that David linked to is based off this NYT recipe, but I think that the socca needs the salt, pepper, and oil that the NYT recipe calls (the Gluten-Free Bay reduces those amounts). I have a special copper pan I do mine in, but best in a wood burning oven. In Florence the cecina is served with fresh ground black pepper, and my favorite ( where I took Shauna and Chef) is at Cantinetta di Verazzano, downtown Florence at their wine bar. the serve a fancy version with truffle butter, prosciutto and arugala, rolled to eat in bites! how did i manage to spend time in Nice and have no idea about socca? as if i needed another reason to go back. Diva: Ok, can’t wait to get back to Florence! I can only agree. and please tell Rosa I say hi! I echo Michelle. Never tried socca while I was in Nice. But oh brother, did I gorge on salade Nicoise and pan bagnet. Still. I need the socca. 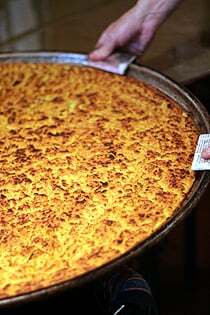 I’m always surprisd how many who visit Nice, never try or knew of socca. One of the most inexpensive. delightful, taste of Provence. Mimi: Yes, like that young woman that didn’t want to try socca, I guess it’s not as widely-known as I thought..more for us! cookiecrumb: I haven’t found a great salade niçoise, but the market in my village, St. Jeannet, makes the best pan bagnat I’ve ever had; filled with raw artichokes, radishes, fava beans, tuna, and lots of dressing. Yum! I’ve never heard of this dish until your column and from the comments it seems like their is an Italian version. I will have to track one down in Rome. It sounds delicious. 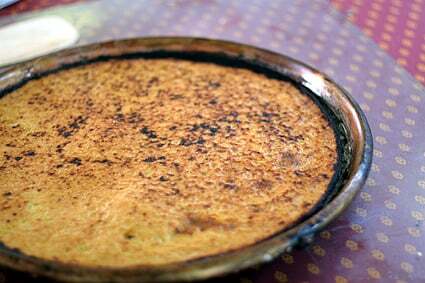 My barber who is from Sicily lived in Genoa for many years where they make a similar version of Socca, different name though. 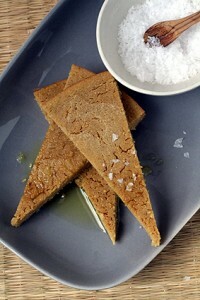 He and I were chatting and I gave him a bag of chickpea flour and a recipe for Socca, he loved it! If I had found this in France I would be hovering also. This looks wonderful! I was just in the south of France last week, but I have never made it to Nice:( That will have to be another visit. If you ever make it up to Carpentras, try Chez Serge. GREAT little restaurant. if we try an at-home version, what would make good accompaniments (other than wine)? I saw a video of you on CNN and it appeared for me to be very interesting. I remembered your URL and after visiting it, I found it very interesting too. I am like jealous (good way of course: ), your life seems to be so interesting for me. Have only tried Chez Thérésa but her socca was well worth queuing under the broiling sun for 20 minutes last May. Not too far from her stand in the Cours Saleya is the mushroom guy (we bought some wonderful morels from him) and near the mushroom guy is the berry lady who sold us the best fraises des bois I’ve tasted. I will give this a try at home. I know it probably will not be a good and what you had but since I will not every get to the places you were I will have the DIY method. I grew up in Nice. Every Wednesday afternoon we would go for swimming lessons in the Old Nice and the highlight would always be the steaming hot Socca dripping with olive oil that we would eat afterwards or the tarte a la belettes (but that’s another story…). I make it at home with my iron pan whenever I have a craving. I have the luxury of living on the Cote d’Azur since last June and all the food is incredible. 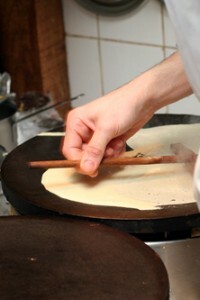 Socca is delicious & the fun is to stand there, mouth watering while Monsieur slowly makes each one! and David, did you see the Basil Gelato in Nice near the flower market? I hope you get a chance to return soon and try to visit Cannes next trip. We have 2 markets, both outstanding. I second David’s recommendation for Chez Thérésa. Her socca is absolutely phenomenal. I will add, however, that in addition to David’s warning to arrive before 1pm, there should also be a warning to expect to wait a loooong time to get some. Thérésa is a one-woman tour-de-force, who acts as hostess, waitress, chef and cashier. They bring in fresh socca one-by-one from her local restaurant, and the socca is divided between the people sitting at the tables, and the people standing in line to get some socca to go. In many instances, for each new socca, only one person standing in line is given the opportunity to purchase some, while the rest goes to the people sitting at her tables. We got in line with about 5 people ahead of us, and waited nearly 45 minutes. With that bit of warning, the obvious question is … was it worth the wait? You bet’cha. Any place you would recommend to try Socca in Paris? I don’t know when I will ever get to Nice. I had farinata for the first time in a restaurant in Chiavari, in the Cinque Terre region of Italy. It was amazing! Do you know where I could buy a farinata pan in the US? @Brett, my husband and I saw Theresa’s stalls after a trip to the flower market we said we’d walk around to work up an appetite. Imagine our disappointment when we went back for lunch to see them washing the pavements. I’ve had the Italian version too also delicious. We’re going to Nice soon and won’t miss out this time. Meanwhile I’ll try David’s recipe. Bon Ap! 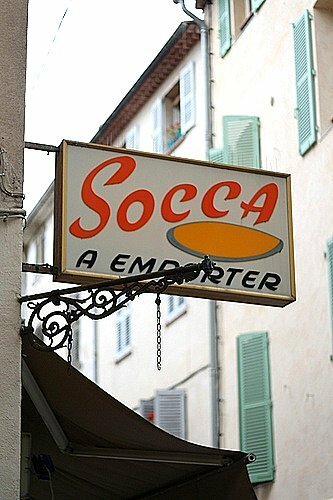 Socca, yes delicious, I went to college in Nice, a long time ago. The realy old authentic place to go, is the “Caves Ricord” who were already dishing out socca when I was a schoolboy, back in the 60’s. They are just on the corner of the place Garibaldi, in Nice. There is always a queue but it moves pretty fast, and you can take it into the adjacent bar and enjoy it with a glass of “vin nouveau”, which is the more traditional thing to drink with Socca in Nice. I still go back there now and again and the place is still going strong! And you can enjoy it without the waiting….